This week’s Treasure Chest Thursday entry is another World War I Draft Registration Card. This time the registrant is my great-grandfather, James Alexander Hemphill. So What Does This Record Tell Us? Name: I think this is the only official document I have that spells out his complete name – James Alexander Hemphill. Residence: Ramhurst, Georgia. While this particular card is not dated, these records were created in 1917-1918, which is important for two reasons. The family moved to Fitzgerald, Georgia and appeared there on the 1920 census, so this document narrows down the time frame for the move. His youngest son was born in 1918, so I can deduce that he was likely born in Ramhurst. Birth date: 13 Apr 1879. This is likely to be the best source of his birth date that I will ever find. Occupation: Self-employed farmer. No surprises there. Nearest relative: Mrs. Alice Hemphill – his wife and my great-grandmother. Physical description: Tall, with black hair and blue eyes. 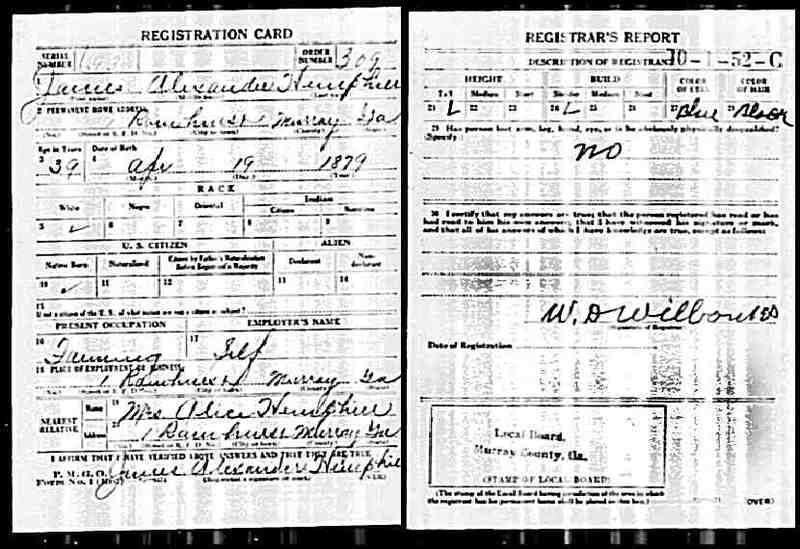 Source: “World War I Draft Registration Cards, 1917-1918,” Database and images, Ancestry.com (http://www.ancestry.com : accessed 29 June 2009), James Alexander Hemphill, serial no. 693, order no. 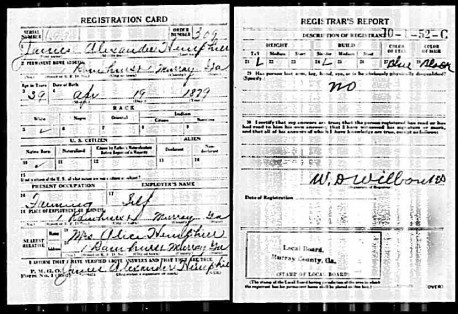 309, Draft Board O, Murray County, Georgia; citing World War I Selective Service System Draft Registration Cards, 1917–1918, NARA microfilm publication M1509; citing FHL microfilm roll 1,558,454. I adore documents like this that I think will preserve the essence of the great war and through this I believe we are able to give importance regarding the history of this great event.